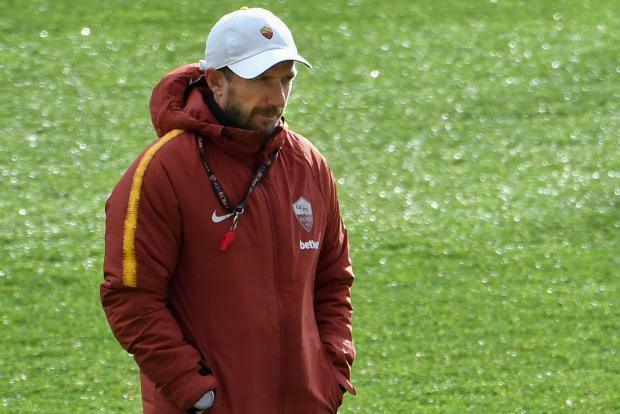 Roma coach Eusebio Di Francesco wants his players to show hunger against Porto. Roma coach Eusebio Di Francesco called on his side to show ambition against Porto in Tuesday's Champions League last 16, first-leg tie at the Stadio Olimpico to rekindle enthusiasm after recent knocks. Roma crashed out of the Coppa Italia with a 7-1 thrashing by Fiorentina but are now unbeaten in their last six Serie A games to sit one point off the Champions League berths. "This game is a great chance to produce a big performance and bring back some enthusiasm," said Di Francesco. "There are only two Italian sides left in the competition, we are proud to be one of them. We have to aim high." Roma reached the semi-finals last season before falling to Liverpool, but have never beaten Porto who have won the competition twice, most recently in 2004 under Jose Mourinho. Sergio Conceicao's side last reached the quarter-finals in 2015, and beat Roma 4-1 on aggregate in the 2016-2017 playoffs. Roma will be without forward Patrik Schick who picked up a muscular problem, but defender Kostas Manolas has returned to training although goalkeeper Robin Olsen remains a doubt. Porto, meanwhile, will be without suspended winger Jesus Corona with top-scorer Moussa Marega injured. Porto are leading their domestic league but recently crashed out of the Portuguese Cup on penalties and have dropped points in successive league games. "Sergio Conceicao is doing a great job," said Di Francesco. "He's given Porto a clear identity, they are more effective now. Despite their injuries, they are a compact, organised side. "It'll be a physically demanding game. We need to be strong defensively tomorrow. "It's vital that we don't concede, although we can't allow that desire to compromise our identity and the way we want to play." Captain Daniele De Rossi returned from injury to help Roma secure a draw against AC Milan and win over Chievo in their last two games. "Team-mates and the coach talk about my importance, but perhaps they don't realise how important they've been to me in recent years. I want to thank them for that," said the 35-year-old. Roma's best run in the competition was reaching the 1984 final before losing on penalties to Liverpool at the Stadio Olimpico. The second leg will take place in Portugal on March 6.